Gather in the sanctuary for a morning worship service with a traditional structure led by both lay leaders and Epworth's pastors. This service includes scripture readings, responsive readings, hymns, a sermon, collection of Tithes and Offerings, and prayers. Holy Communion is shared the first Sunday of each month. A time of fellowship follows the service in the Narthex. Everyone is welcome at this casual service held in the Fellowship Hall. The congregation gathers around tables and enjoys refreshments. Worship is led by Epworth's pastors with music led by the Praise Singers. This time of worship includes scripture readings, sharing Glory Moments and Congregational Concerns, a message for children, a sermon, collection of Tithes and Offerings, and prayers. Music is a mix of contemporary and traditional songs. Holy Communion is shared the first Sunday of each month. This traditional service is held in the sanctuary with music offered by the Chancel Choir, our organist, and occasional special music by instrumentalists and our Children's Choir. This service includes scripture readings, responsive readings, a message for children, hymns, a sermon, collection of Tithes and Offerings, and prayers. 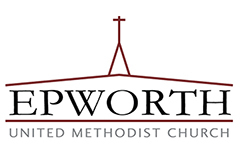 Epworth's pastors preach and lead worship. Lay leaders and youth participate in different roles in this service as Liturgists, Acolytes, and Crucifers. Holy Communion is shared the first Sunday of each month. Children of all ages are welcome and nursery services are also available.